You may find yourself plunging your toilet once per week, if not more – but that doesn’t have to be the case if you can avoid some of the most common reasons for why your toilet is clogging in the first place. Many people tend to treat their toilets as trash cans. Keep in mind that seemingly innocent items such as tissue (Kleenex) shouldn’t be flushed down your toilet because they do not break down the same way as toilet paper. You should also avoid flushing tampons, condoms, kitty litter and dental floss down the toilet as all of these items can cause clogs as well. To remedy this situation, consider placing a trash can in your bathroom so that these items can be easily disposed of. This trap separates your toilet from the drain line and is responsible for stopping sewage gases from making their way into your home. However, it is possible for an object (even paper towel, for example) that has been flushed down the toilet to be stuck in the trap. Over time, this object may collect a lot of debris every time the toilet is flushed, which eventually leads to a clog. You may be able to send the debris into the sewer line by plunging, but this will not fix the problem. You need to get to the trap by taking the toilet off of the floor. This situation is best left to a professional. If you have an older, low flow toilet, it may not have as much flushing power to meet its demands. While low flow toilets on the market today are often better than regular flush toilets, if you have an older low flow toilet, however, you may want to consider replacing it with a newer model. Another common reason for a clogged toilet is blocked plumbing vents. Keep in mind that your toilet drains vent through your roof, but if they are clogged, your toilet will not be as efficient at flushing and this can lead to a clog. This problem is best fixed via a professional who will clean the plumbing vent on the roof. If more than one toilet in your home is experiencing clogging, it may come down to a sewer line problem. For example, it is possible that there is a clog in the sewer line or tree roots have grown into it. If you suspect that this is the problem, contact a professional to clear the sewer line. 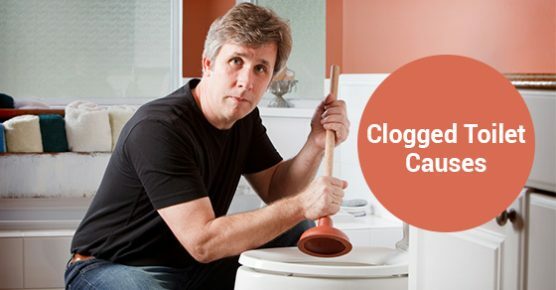 If you are in need of a professional plumber to fix your clogged toilet, contact Advanced Plumbing today for more. We offer quick, around-the-clock services.